Institute manager Kevin Deery was very angry after their Tennent’s Irish Cup exit to Linfield. Deery felt some of the decisions referee Ian McNabb made were controversial to say the least. The Glengormley official failed to award the home side a penalty early on when it looked clear that Jamie McIntyre was brought down inside the box by Chris Casement, however the Stute winger was cautioned for diving. Then in the second half with the tie sitting in the balance, the referee incredibly disallowed Mark Scoltock’s equaliser for pushing with 20 minutes remaining and to compound matters he then sent-off Aaron Harkin for two bookable offence, as the midfielder took his protests too far. Jamie McIntyre doesn’t dive; I’ve watched him now for 80 games in charge of Stute and I’ve never seen the young fella dive. It’s a stonewall penalty as well. “Jamie McIntyre doesn’t dive; I’ve watched him now for 80 games in charge of Stute and I’ve never seen the young fella dive. It’s a stonewall penalty as well. “I don’t know how it wasn’t given, and to then book him was crazy. Deery was also a frustrated by the fourth official Peter McGrath’s display. “You come out and do your best in football to have good experiences and it wouldn’t have been a bad experience but for the fourth official; it was terrible some of the things he was saying to myself, Paddy (McLaughlin) and Kevin Doherty. The Stute gaffer now wants his players to dust themselves down and have a big end to their league campaign. “I know we’re capable of competing against the best in this country week in and week out,” he added. “The players are absolutely disgusted with the decisions. They gave everything of themselves. 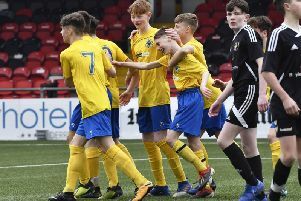 “We just now have to get to a level where it’s like that for the next eleven games; we’re still not out of this and we can still push Ballyclare all the way. The Stute gaffer did praise the Blues for their early spell after the break, which in the end led to their opening goal. “Linfield set up a wee bit slowly in the first half but to give them credit they did thing a wee bit quicker in the five minutes after half-time. We just didn’t manage that period well. You could see that our luck wasn’t in today again. “A wicked deflection off Stephen O’Donnell goes to a Linfield player (Cameron Stewart) for a cushioned header at the back post. “It’s so disappointing, when you put so much into something and you have no say in it with poor decisions. “We were in a number of great positions; we had a great goal disallowed, Niall (Grace) was driving from midfield and Mickey (McCrudden) had a couple of chances I felt that we looked the more threatening team at times. “What do you do? You question what it’s all about at times whenever you watch some of that remarkable stuff from the officials.